A combined system with photovoltaic panel modules, which extracts heat from water or air and produces thermal and electrical energy which is called a solar photovoltaic or solar thermal photovoltaic thermal (PV/T) system. A way to enhance the electrical efficiency of the PV module is by diminishing the temperature at which the module is working, i.e. by extracting thermal energy. The design of the solar Photovoltaic/Thermal provides certain advantages. When the temperature is increased 1°C, the photoelectric efficiency decrease by 0.5%. This work is principally aimed to clarify the effectiveness by means of the exergy generated in a PV/T hybrid water module, a photovoltaic thermal module, generating thermal and electrical energy. Were determined the energy, exergy and the efficiency of the power conversion for a certain amount of days in function of the solar intensity, the temperature of the module and environmental temperature. During the hours 9:00 am to 3:00 pm, the efficiencies of exergy and power conversion varies according to the following values, between 2.16 - 12.27% for the exergy efficiency and between 5.2 - 11.2% for the power conversion efficiency as well as, the energy efficiency varies between 6.89 – 14.9%. The temperature of the photovoltaic module has a great impact on the electrical, thermal and exergy efficiencies. Moreover, these efficiencies can be enhanced by removing energy in form of heat from the surface of the photovoltaic module. 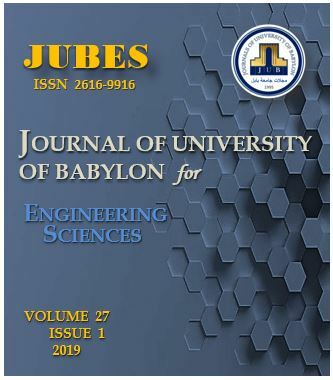 D. Mutasher, M. Mohammed, and Z. Obaid, “Energy and Exergy Performance Calculation of Solar Photovoltaic/ Thermal Hybrid System under the Baghdad Environment”, JUBES, vol. 27, no. 1, pp. 130 - 141, Jan. 2019.